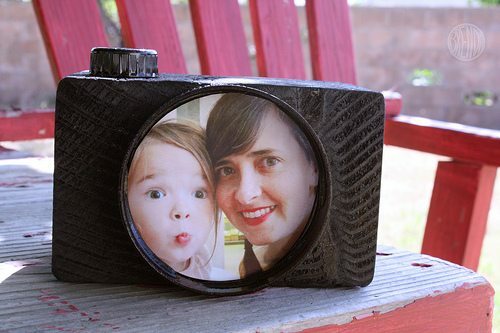 Father’s Day Craft: The Daddy Cam! Finding the right size block of wood will probably be your biggest challenge. If you’re lucky, you might already have blocks of wood this size on hand if you have a carpenter in your family or you live near a construction site. But if you’re like me, you’ll have to head to the hardware store to find just the right size block of wood. First check the culled wood in the back of the store to see if you can find a leftover piece for a discounted price. If nothing turns up there, you might be able to turn on the charm and ask your local hardware employee to look through their discards for you. If that fails, then you’ll probably have to buy a full sized board and have the hardware employee cut it down for you. Usually the first two cuts are free and every cut after that costs 25 cents. I purchased a 4×6 eight-foot board for a little under ten dollars and had two 3-inch segments cut off. The rest I took home to save for some other project. Seesaw anyone? 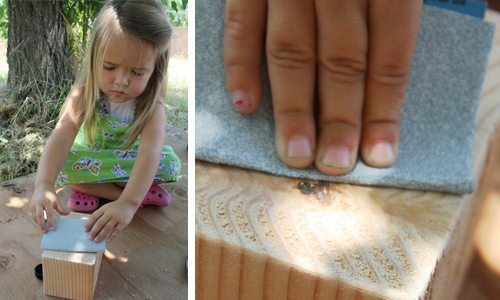 All you need to do is sand the wood blocks until they have smooth rounded edges and no super-rough splinters sticking off of them. 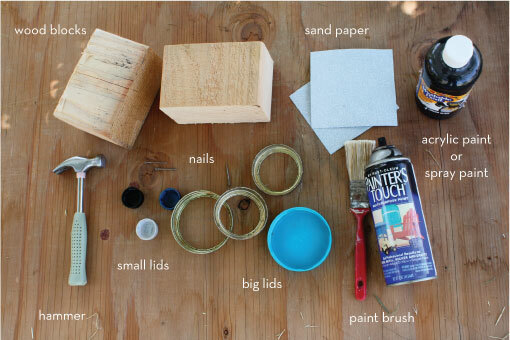 After you have your block sanded, you’re ready to paint! 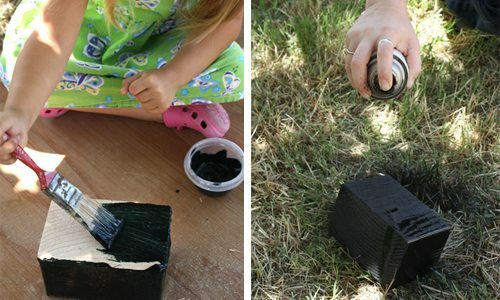 Painting with (safe and non-toxic) acrylic paint and a brush is more hands-on and fun for younger children but spray-painting is quick and easy too. 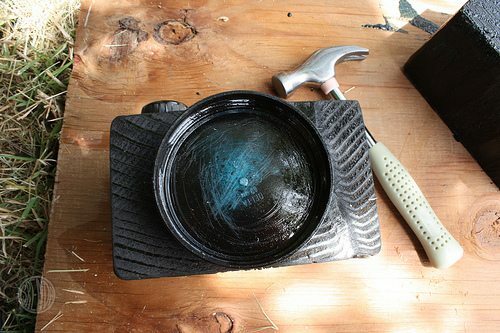 Paint your wood block, your jar lid and the water bottle cap all black. If you live in a warm climate like I do, your paint will be dry in less than an hour. 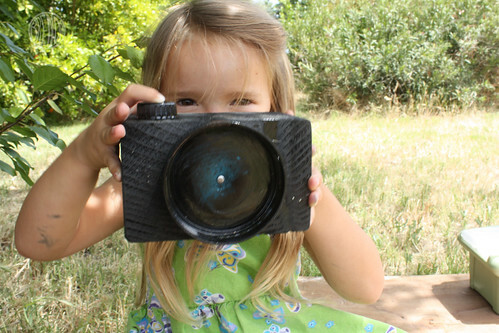 Now you’re ready to attach the lens and the shutter button. The peanut butter jar lid was super easy. It only needed a small tack-nail hammered into the middle to affix it nice and tight. A canning jar lid will need to be glued on with a hot glue gun but that’s pretty easy too with a thin bead around the edge. Attaching the shutter button is a snap. Affix it to the top of the block on the left side and nail another nail right through it in the center. Easy peasy and your camera is done! Say Cheese! You’re on the Daddy Cam! 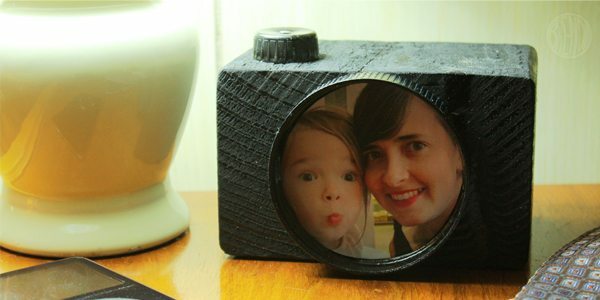 All you have to do now is glue a photo into the center of the lens and you’re done! What a darling idea! 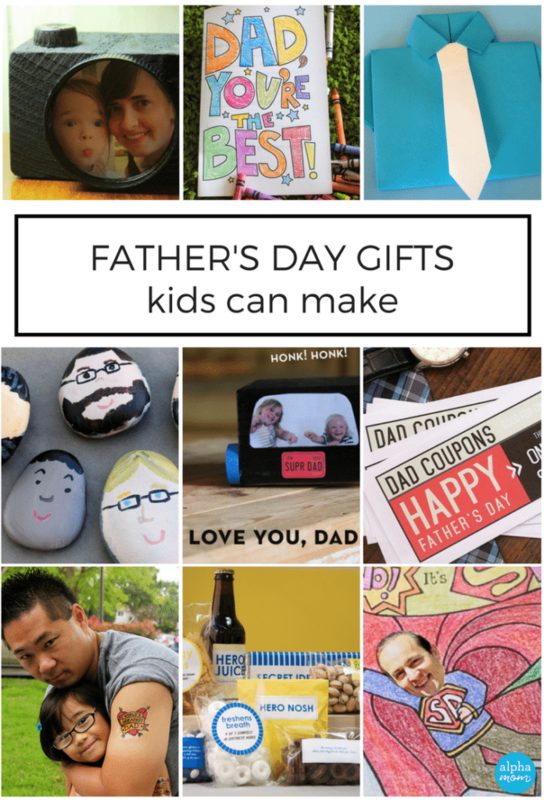 It would look great on any father’s desk! The photo is adorable too! This is a fabulous idea, all those snap happy kids out there! Love the new look of the site too! So I LOVE THIS and I posted it on my blog (just picture)linking them back to you and telling them to check you out!! So I love this and I’m going to do it. Exactly what size did you use for the wood? oh my gosh! this is supercute! Absolutely LOVED making this with my preschoolers! Their parents were speechless! Thank you so much! Che bello il tuo sito 🙂 continuerò a seguirti! wow !! it is reallly wonderful creative craft . i like it. so cute photo camera frame..